Confidence is a trait James Kirk never seemed to lack in Star Trek's recent film reboot, but for that quality to truly manifest itself into something meaningful, it requires the respect and loyalty of one's peers. That's something we never had a chance to see in play during the squad's first adventure, as Kirk spent the entire tale proving his worth and, ultimately, staking a claim to the captain's chair. 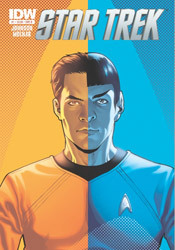 When we rejoin the cast in this month's Star Trek #1, and presumably in the forthcoming sequel, Kirk has already completed his transition from ragged potential leader to proven, venerable commander. In some respects that's a good thing; leaving the origin chapter behind can only open new doors to adventure. Eventually the core group members have to embrace their responsibilities and push forward as a bright, versatile young unit. However, it also runs plenty of risks, some of which aren't so deftly avoided in this very issue. When Kirk, Spock and Bones step away from the bridge to discuss a sudden threat to the Enterprise, for example, the conversation could just as easily have come from the mouths of Shatner, Nimoy and Kelley as their fresh-faced counterparts. They've already slid too easily into the static, classical roles associated with each character, and the last thing the fledgling crew should be doing at this point is getting too comfortable on the bridge. After all, what's the point of taking a new direction if it's just going to wind up in exactly the same place as before? I suppose it's inevitable that some amount of revisitation is in order for such a long running, well-regarded series. The plot of this month's issue, notably, is lifted almost directly from an episode of The Next Generation. What's to stop the movie franchise from going a similar route and resurrecting Khan in the near future? And who's to say they'd be wrong to do so? My concern is that too much reverence is paid to the original tales at the cost of ingenuity and fresh thinking. It's a very thin line between the two, but I left this issue with the impression that it wound up standing on the wrong side. Excessive familiarity does breed contempt, after all. Fortunately, the artwork doesn't subscribe to quite the same mantra as the storytelling. Stephen Molnar's linework is loose and playful, more concerned with gesture and character than rigid technical proficiency. Though he does occasionally tread a bit too near the uncanny valley in some of his interpretations of the actors behind each role, those transgressions are usually tempered by a crisp, clean environment and a quick return to form in the next panel. Molnar doesn't get much liberty to light up the page in this bookful of board rooms and staff meetings, but he does manage to keep things fresh and interesting all the same. Sadly, as slightly more than a passing fan of the Trek mythos myself, I found the new troupe's debut issue redundant and actionless, a safe reinterpretation of a classic story that never manages to shift out of first gear. Though forthcoming issues may promise more in the way of exploration and extraterrestrial encounters, the tone that's been set in this initial adventure is a long ways from reaching the potential set by its celluloid predecessor. Die-hard Trekkies might enjoy it as an appetizer for things yet to come, but even they will find plenty of minor ticks and glitches to pick away at. Flip through it.